How Does the Cboe’s VIX® Index Work? The Cboe did not create the VIX as an academic exercise, or as a service to stock market prognosticators everywhere. They created it because they wanted to make money on volatility. It took them two tries, but the CBOE succeeded in developing a volatility index that forms the backbone of a host of volatility products. The CBOE offers some of these products, but other companies have built on the success of VIX to offer their own volatility based products. To have a good understanding of how the VIX works you need to know how its value is established, what it tracks, what it predicts, and how the CBOE makes money with it. How is VIX’s value established? The VIX is a computed index, but unlike indexes such as the Dow Jones Industrial Average or the S&P 500 it’s not computed based on stock prices. Instead it’s based on option prices. Specifically the prices of options on the S&P 500 index (ticker SPX). One component in the price of SPX options is an estimate of how volatile the S&P 500 will be between now and the option’s expiration date. This estimate is not directly stated, but is implied in how much buyers are willing to pay. If the market has been gyrating like mad option premiums will be high whereas in a quiet market they will be much cheaper. There are various ways of extracting the volatility information from option prices. The standard way is via the Black & Scholes model, but those equations assume that volatility will be the same for all available options—something that is definitely not the case and they also underestimate the risk of a market crash. The CBOE’s approach combines the prices of many different SPX options (hundreds) to come up with an aggregate value of volatility. Their approach has some particular advantages—more on this later. There are many good posts here, here, and here on the details of the actual VIX calculation, so I won’t reinvent the wheel. There’s nothing magical about the 30 day estimate. The CBOE uses the same methodology to compute 9 day (VXST), 93 day (VIX3M), and 180 day (VXMT) volatility indexes. The moves of the VIX track prices on the SPX options market, not the general stock market—this is a key point. The SPX options market is big, with a notional value greater than $100 billion, and is dominated by institutional investors. A single SPX put or call option has the leverage of around $200K in stock value—too big for most retail investors. In general option premiums move inversely to the market. In a rising market, stock prices tend to be less volatile and option premiums low—hence a lower VIX. Declining markets are volatile (the old saying is that the market takes the stairs up and the elevator down) and option premiums increase. Much of this increase occurs when worried investors pay a large premium on puts to protect their positions. While S&P 500 option premiums generally move opposite to the S&P 500 itself they sometimes go their own way. For example, if the market has been on a long bull run without a pullback institutional investors will become increasingly concerned that a correction is overdue and start bidding up the price of puts—leading to a rising VIX in spite of a rising S&P. Historically 20% of the time the VIX moves in the same direction as the S&P 500—so please don’t claim the VIX is “broken” when you see the two markets move in tandem. Another way to look at the moves of the VIX is to recognize that it’s almost always a few percentage points higher than the recent historical volatility of the S&P 500. It’s a good assumption that the future volatility of the market will be the same as recent volatility—but obviously, this relationship doesn’t always hold. Option market makers demand a premium to justify the risk they assume in buying / selling options in the face of this uncertainty—and this premium shows up as a VIX value greater than historical volatility. There are around 25 volatility Exchange Traded Products (ETPs) that allow you to go long, short, or shades in-between on volatility (see here for the complete list), but none of them do a good job of matching the VIX over any span of time. For more on ways to trade volatility see How to Go Long on the VIX, and How to Go Short on the VIX. What does the VIX predict? In my opinion, nothing. I think it does a good job of reflecting the current emotional state of the overall market (e.g., fearful, optimistic), but I don’t think the SPX options market is any better at forecasting the future than any other market or index. We don’t take the value of the Dow Jones Industrial Average as a predictor of the future, so why should the value of the VIX be any different? How does the CBOE make money on the VIX? The “O” in CBOE stands for options. In the early 90’s the CBOE wanted to sell options on volatility, but there was a problem—options need to be based on an underlying tradable security to function, and there wasn’t one. To address that gap the CBOE created an index that could form the basis of a volatility futures market. Once that market was functioning then options could be introduced. 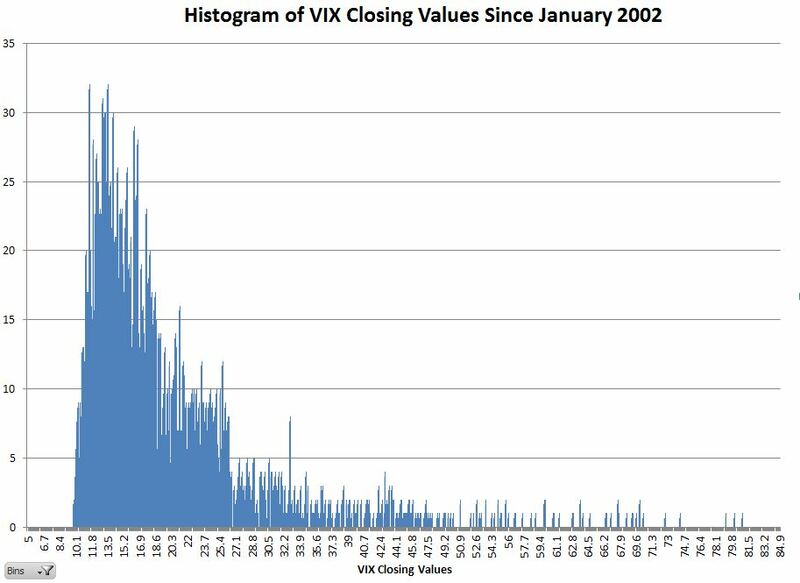 Version one of the VIX index (now named VXO) was introduced in 1992, but futures based on it were never available. For a futures market to function, the market makers need to be able to cost-effectively hedge their positions. Hedging the 1992 version of the VIX required frequent rebalancing of SPX options that was too expensive to implement. Undeterred the CBOE introduced version 2 in 2003. The new methodology allowed market makers to hedge their positions with a static portfolio of SPX options that could be held until the VIX futures expired. VIX Futures started trading in 2004 and in 2006 options on VIX futures were rolled out. VIX futures and options have been very successful with recent daily volumes in the hundreds of thousands. The CBOE is generating hundreds of millions of dollars in annual revenues from these products—primarily from highly profitable transaction fees. The VIX frustrates a lot of investors. It’s complicated, you can’t directly trade it, and it’s not useful for predicting future moves of the market. In spite of that, the investment community has adopted it, both as a useful second opinion on the markets and as the backbone for a growing suite of volatility based products. But what impresses me is the vision and persistence of the people at the CBOE in advancing the highly theoretical concept of stock market volatility from an academic exercise to an effective commercial product. It was a multi-decade project and they were successful. How Meaningful are the VIX’s Percentage Moves?